We bought these duck breasts from our favorite butcher. Yum. Take note of the color of the meat. We like our duck breasts nice and pink….DElicious. Prepare the Duck: With a sharp knife, score the skin of the duck breasts in a crosshatch pattern. In a large, shallow dish, combine the olive oil with the lemon peel, lemon juice, thyme, rosemary, shallot, horseradish and garlic. Add the duck breasts and turn to coat. Let the duck stand at room temperature for 2 hours, turning a few times. Make the Fig Sauce: In a small saucepan, combine the figs with the chicken stock and bring to a boil over moderately high heat. Cover and simmer over moderately low heat until the figs are tender, about 10 minutes. Remove the figs from the stock, chop them coarsely and return them to the saucepan. In a small skillet, melt the butter. Add the minced garlic and cook over moderate heat until it is fragrant, about 30 seconds. Add the brandy and simmer for 1 minute. Add the rosemary sprig, figs and fig stock and simmer over moderate heat until the sauce is slightly thickened, about 3 minutes. Season the fig sauce with salt and pepper, cover and keep warm. Scrape the marinade from the duck breasts and season them all over with salt and pepper. Put the duck breasts in a large cast-iron skillet, skin side down, and cook them over moderately low heat until most of the fat has been rendered, about 10 minutes. Increase the heat to moderate and cook the duck breasts until the skin is browned and crisp, about 4 minutes. Turn the duck breasts and cook them until they are medium-rare, about 3 minutes longer. Transfer the duck breasts to a carving board, skin side up, and let them rest for 5 minutes. Slice the duck breasts crosswise and transfer to plates. 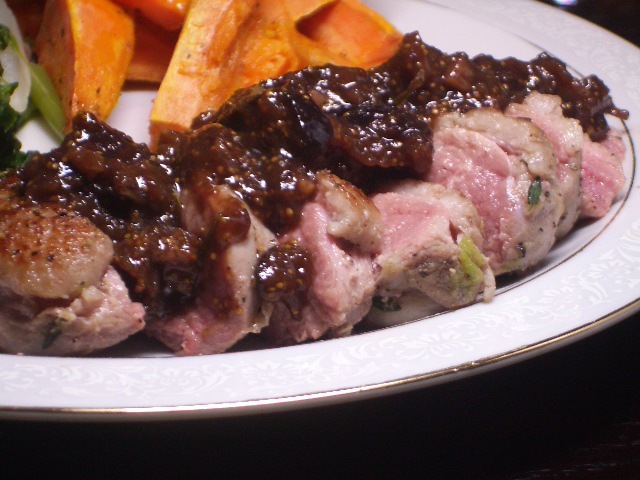 Discard the rosemary sprig, spoon the fig sauce over the sliced duck breasts and serve. Make Ahead Option: The fig sauce can be refrigerated overnight. Reheat the sauce gently before serving. This is adapted from a Food and Wine recipe. The original can be found here. Also on the plates above you can see snippets of Boiled Kale with Turnips and Side Meat and Roasted Sweet Potato Spears.